A 100-year-old crane is opening to the public as a visitor attraction after a £3m restoration project. 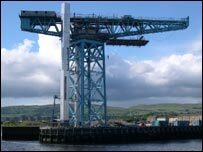 The Titan crane at Clydebank is believed to be the oldest of its kind in the world. A new lift has been installed to take visitors to the jib platform and wheelhouse some 150ft off the ground. The A-listed structure was used at the John Brown shipyard, where it helped with the construction of warships and vessels like the Lusitania and the QE2. One of five Titan cranes designed by William Arrol for Clyde yards, it survived the Clydebank blitz unscathed despite being a target for German bombers. It will be open to the public from 3 August, but Communities Minister Stewart Maxwell was the first visitor on Friday morning. He released 1,000 balloons containing free tickets to the attraction. Those making the journey to the top will be able to see the workings of the crane and use digital technology to go back in time to relive the launches of the Queen Mary and the QE2. The two-year restoration project was carried out by urban regeneration company Clydebank Re-built. 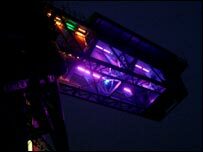 Glasgow-based Collective Architecture produced the plans for the structure, which also included the illumination of the crane.